Oil and gas exploration and development in Wyoming produces a regular stream of new, updated subsurface and production information. In an effort to disseminate this updated information more frequently, the Wyoming State Geological Survey (WSGS) launched a new interactive, online version of its Oil and Gas Map of Wyoming. The WSGS recently published the 2016 print map, Map Series MS-103, that is available as a free downloadable PDF. Over the years, the map has been one of the Survey’s most popular publications and is used by industry, researchers, policy makers and the public. The online version complements and enhances the traditional paper map by providing additional data, functionality and the ability to be updated more frequently. Hardcopies of the Oil and Gas Map of Wyoming may be purchased by contacting the WSGS at (307) 766-2286. More than 36,000 CBNG wells were drilled in the Powder River Basin (PRB) during coal bed natural gas (CBNG) development. The Wyoming Oil and Gas Conservation Commission (WOGCC) reports that from 2001 to 2014, the PRB produced more than 5.6 trillion cubic feet of CBNG and nearly 954,000 acre feet of groundwater. As a result, groundwater levels were substantially lowered in areas undergoing development. Previously, the WSGS examined groundwater level recovery in the Upper Wyodak coal zone. What is more important to the non-CBNG groundwater users in the PRB, however, is the potential effect that production has had on water levels in the overlying sandstone aquifers. Those aquifers provide water to nearly 14,000 permitted groundwater wells designated for domestic, municipal, agricultural and livestock uses. Average monthly CBNG water production in the PRB in 2015 had declined by 72 percent over 2006 when water production reached peak levels. This decline in the volume of co-produced groundwater provides an opportunity to examine groundwater level recovery in the sandstone aquifers and to evaluate the actual effects of CBNG development on other groundwater users. WSGS is currently assessing groundwater responses to declining CBNG production at 40 U.S. BLM well sites where water levels in both coal zone and adjacent sandstone aquifers are monitored. The WSGS will publish the results of this study later this year in an Open File Report. 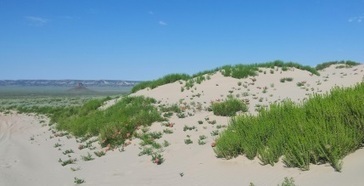 An ongoing project at the WSGS is an industrial sands investigation into locations, availability and quality of sands that can be used in Wyoming’s oil and gas industry and other potential markets. Little to no detailed studies, including paleoseismic investigations or fault scarp morphology, have been conducted on fault strands north and south of Blacktail Butte in eastern Jackson Hole. The fault strands south of Blacktail Butte are classified as Late Quaternary, while the faults north of the butte are considered Class B (Late Tertiary/Early Quaternary) structures by the U.S. Geological Survey (USGS). Geologists are investigating the location and offset of these faults. They will utilize LiDAR data in Grand Teton National Park and recent aerial photographs to provide data for revised mapping and geomorphic interpretation of fault-related features north and south of Blacktail Butte. The WSGS is in the midst of a large project involving renovating and streamlining the structure of the Wyoming Database of Geology (Wyo-DOG) database and plans to have a publicly available version online in the near future. 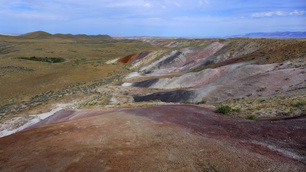 Wyo-DOG is a WSGS database that includes information on mineral-related samples collected across the state, such as information on sample locations, lithology, formation, and structural and analytical data, as well as links to pertinent literature references. Currently, analytical results included in the database are geochemistry and radiometric data. Geologists have been in the field all summer collecting data for geologic maps being published under the USGS StateMap program. The program’s objective is to establish the geologic framework of areas vital to the welfare of individual states. Geologic mapping is a critical area focused on by the WSGS. Since 1994, the Survey has participated in the StateMap Program and CoGeomap prior to that since 1985. 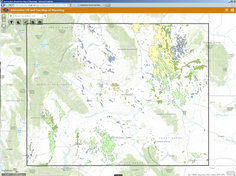 Once this year’s maps are completed, the WSGS will have produced 25 geologic maps at 1:24,000 scale and 75 geologic maps at 1:100,000 scale with funding from the StateMap program totaling about $3.5 million in state and federal funds. The WSGS is developing a groundwater recharge map for the state of Wyoming. The map is based on an empirical (data driven) mathematical model that uses publicly available streamflow, precipitation, evapotranspiration, topographical and soils data from the most recent 30-year-period of record (1981- 2010). Data were collected from the USGS, the PRISM Climate Group at Oregon State University and the National Resources Conservation Service. Preliminary application of the new model produced reasonable estimates of annual recharge for the state’s six major river drainage basins when compared to net stream outflows adjusted for streamflow depletions. In another analysis, WSGS recharge estimates for the Wyoming portion of the Powder River Structural Basin show close agreement to estimates reported by the USGS using a Soil Water Balance Model. The WSGS empirical model is under review by the USGS. Final results are expected to be published on the WSGS website later in 2016. WSGS geologists have conducted and concluded various studies statewide, including an investigation examining the salinity of groundwaters occurring at depths less than 5,000 feet in the Denver-Julesburg Basin structural basin where significant oil and gas activity has occurred in recent years. Hundreds of water quality analyses from the USGS were examined, as were geophysical well logs from the WOGCC. The results of the study showed occurrences of naturally occurring moderately saline groundwaters first appear in scattered locations in the basin at 3,500 feet below the surface and widen with depth to encompass the northern half of the basin between 4,500 to 5,000 feet. Naturally occurring saline waters can also be found at depths greater than 4,000 feet in a smaller area stretching across the central basin north of Burns and Pine Bluffs. While completing geologic maps, geologists discovered sinkholes and other evaporite karst features in the southern Laramie Basin that became the focus of another report. The study involved examining geophysical well logs and reviewing historical records of gypsum karst occurrences in the basin. Karst features discovered in the area include gypsite deposits, underground cavities and sinkholes. Under certain conditions, flowing groundwater can dissolve evaporitic geologic deposits, leading to the formation of these karst features, and once formed, they can disturb infrastructure such as buildings and roads. A review of early aerial photography in the vicinity of the city of Laramie showed the occurrence of sinkholes in areas where residential developments now exist. A mineral used in the production of popular items such as rechargeable batteries occurs in low levels in soil, groundwater and rocks across Wyoming, according to a recent study. It’s the first such comprehensive study on Wyoming’s lithium resources, and it includes historical research coupled with recent field investigations. Geochemical data were reviewed for nearly 68,000 Wyoming sediment, soil, rock and water samples obtained from seven state and federal databases. Additionally, geologists collected 697 rock and soil samples. Annual demand for lithium compounds has grown 10 percent since 2000, and demand for battery-grade lithium has increased more than 17 percent annually since 2007. Lithium is the earth’s 25th most abundant element and is present in many geologic materials, but almost always in low concentrations. Currently, Chile, Australia, China and Argentina produce most of the world’s lithium from hard rock mines or groundwater brines. The lithium investigation was requested and funded by the Wyoming State Legislature. 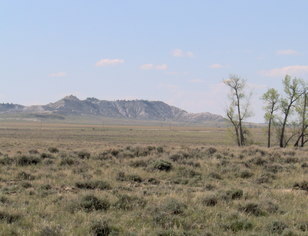 For several decades, production of phosphate rock has been dormant in Wyoming. However, a new WSGS report acknowledges notable phosphate deposits remain in the state. Geologists involved in the investigation believe the data presented in this report is a great starting point for initiating new phosphate exploration and resource evaluation in the state. Ninety percent of mined phosphate rock worldwide is used in agriculture and food production, mostly as fertilizer, with some for animal feed and food additives. Phosphate rock is a natural resource crucial to global food security, and occurrences in Wyoming could help the increasing demand for the mineral as the world’s population climbs. Two investigations requested and funded by the Wyoming State Legislature examined zeolites and rare earth elements (REE). Natural zeolites are hydrous, aluminosilicate minerals that typically contain alkali and alkaline earth metals, and occur in a wide range of geologic settings. The mineral’s abilities of adsorption, desorption, and reversible hydration and dehydration make them useful in agriculture, hazardous waste containment, odor control, water and air purification and cement manufacturing. Geologists involved in the investigation found Wyoming hosts potentially commercial-grade natural zeolite deposits that have only been developed on a small scale. They also determined zeolites offer prospective development opportunities for several reasons, including that Wyoming hosts deposits of natural zeolites in minable quantities. 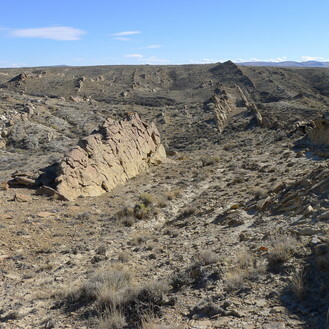 The second study involved REE occurrences in Wyoming, with authors of the report identifying various geologic environments in the state in which the mineral occurs. The 17 metallic elements in the REE group are a vital resource to industrialized societies and necessary for energy generation, transportation, data transmission and national defense. 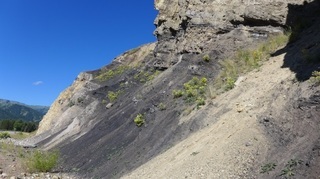 Geologists concluded it is vital to the country and world that more REE resources be found and made available for use. The report includes publicly accessible chemical analyses across Wyoming, which may aid companies and prospectors in their search for economic deposits of other types. WSGS geologists completed a study concerning the hydrocarbon-generation potential of the Lance and Fort Union petroleum systems in the eastern Greater Green River Basin. The purpose of the investigation was to see if natural gas and condensate produced recently from Fort Union wells in the central Washakie Basin was an isolated occurrence or if there is the potential for natural gas in these formulations elsewhere in the basin. After careful stratigraphic correlations, the study concluded that the lower members of both formations have the greatest potential as natural gas reservoirs, but that natural gas generation likely occurred only in the deepest parts of the basins. Specifically, results suggest gas generation in both formations in the central Washakie Basin, but only in the Lance Formation in the Great Divide Basin. This was the first of two studies that will be published this year on the Fort Union Formation in the eastern Greater Green River Basin. The second investigation will center on the potential of coal in the Great Divide and Washakie basins. The WSGS this year welcomed three new staff members to the team, office specialists Onies “Niesey” Heckart and Bridget McGuire, and outreach and publications manager, Christina George. Niesey Heckart is the office’s first point of contact for the public. Since coming on board, she’s developed a point of sales system and has assisted with building the online sales and publications website. Niesey manages sales and inventory, both online and in-house, and assists with post-production of publications. Niesey is a fifth-generation Laramie native and a cabinet maker, which she did for more than a decade while living in the Teton valleys of Wyoming and Idaho. She has an associate’s degree in engineering technology. When she’s not mountain biking, she is snow biking, and when she’s not doing either, she’s spending time with family, friends and almost always with her dogs, Zoe and Merle. Other hobbies include woodworking, failing at gardening, and volunteering for local trail maintenance and community bicycling endeavors. Bridget McGuire serves as back-up for Niesey in addition to being responsible for updating the Survey’s product inventory online and assisting with checking out and returning of office equipment. She also handles archives, specifically scanning and organizing the information, and takes care of maintenance of the agency’s vehicles. Bridget has called Wyoming her home for most of her life, with the exception of a year in Germany and time spent in Idaho and Washington. She is a former massage therapist who had a practice in Vancouver, Washington, for 13 years. She likes to read, sew, cook and watch movies, and for the past four years has been enjoying renovating her home. Christina George’s responsibilities include the editing, designing and coordinating printing and publicizing of reports, including the most recent ones focused on REE and zeolite resources in Wyoming. She also writes and disseminates news releases, and one of her goals is to strengthen outreach opportunities. With Bridget and Niesey, Christina also serves on the WSGS’ web team, making routine updates to the website. 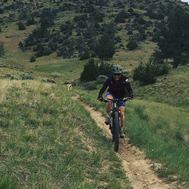 Christina was born and raised in Lander and is a graduate of the University of Wyoming. She’s spent nearly a decade in newsrooms in Wyoming and Oregon reporting on a variety of beats. 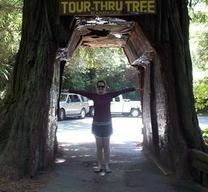 She enjoys taking road trips with her husband, anything outdoors (especially camping) and reading a good book. This year's theme for Earth Science Week, Oct. 9-15, is "Our Shared Geoheritage." Information about the celebration will soon be available on the WSGS website.